George Gershwin, the son of Russian immigrants who settled in New York, joined the popular music business in his mid-teens, composing his first song in 1916. Other songs were written for inclusion in Broadway shows leading to La La Lucille! (1919), a complete Broadway score, the first of a series of stage works that placed Gershwin at the centre of New York theatrical life for 15 years, and which formed the platform for his prodigious melodic talent. In 1919 he also composed his first big ‘hit’, Swanee, recorded the following year by Al Jolson and earning Gershwin $10,000 alone in that year. 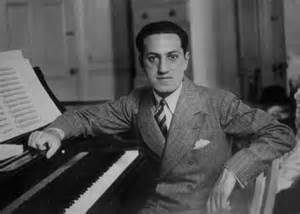 Gershwin did not consider classical and popular music as discrete genres, and in Rhapsody in Blue (1924) for piano and orchestra combined elements from each genre with success, as well as in such large scale works as the Piano Concerto (1925) and the opera, Porgy & Bess (1935). In a significant number of works he was also not afraid to introduce some of the compositional techniques associated with the latest classical music to convincing effect. This entry was posted in Composers and tagged Gershwin, popular music.